Startup Tentrr will let you go camping in luxury. The Airbnb-like platform matches campers with land on private properties, but most importantly, provides a fully-equipped campsite for each reservation. 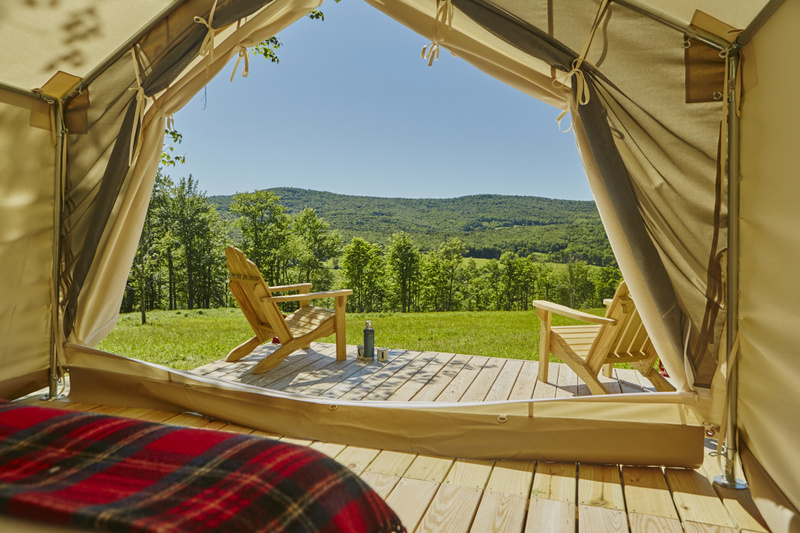 Each Tentrr reservation includes a large wooden tent platform, an inflatable queen-sized cot, chairs and picnic table, a fire pit and campfire grill, a five-gallon collapsible water container and even a Tentrr Camp Toilet. It costs $120 per night—high-end camping for those who want to escape to nature, without a course in outdoor survival skills. Tentrr properties are secluded and unusual: campers can hideout in the former Catskill Game Farm, a zoo that closed in 2006, or by a stream surrounded by acres of fields and apple trees. Tentrr currently only lists properties in the Northeast U.S. (from Pennsylvania to Maine) but the site hopes to expand to the Pacific Northwest, and perhaps elsewhere, later this year. The most interesting aspect of Tentrr isn’t property sharing, but the packaged, custom-made campsites. Its custom flatpack five-person dome tent comes with a picnic table and sun-shower. Campsite owners pay a $1,500 membership fee to have a Tentrr set up onsite. Campers can add on accommodations at extra costs, like a Camp Fire Goodies Kit ($30) that includes chocolate and marshmallows ready for roasting or a Morning Perk Kit ($15), which includes supplies for morning cups of tea, coffee and instant oatmeal.